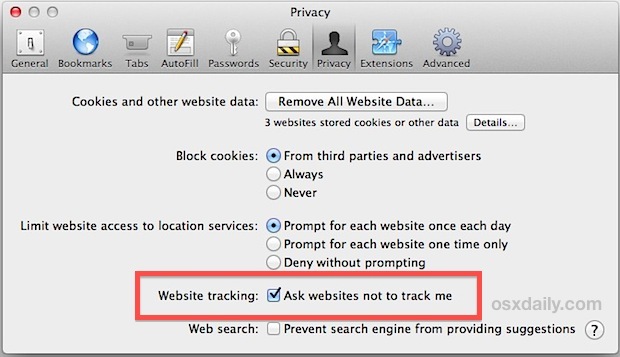 Do Not Track is a new privacy feature in Safari 6 that causes Safari to tell certain websites to not track you online as you browse the web. This prevents social platforms like Twitter, Facebook, and Google, from tracking you across the web, and it also causes ad servers and analytic services to not follow your browsing history. In some ways this could be looked at like an alternative to ad blockers, but ultimately the no-tracking feature is more useful for those concerned about privacy since ad blockers don’t prevent things like Facebook from following you around the web. Because the Do Not Track movement is in it’s infancy, not all services will comply with the request, but for anyone who wants the utmost privacy on the web without always using Private Browsing it’s better than nothing. The Do Not Track feature isn’t yet available on iPhone and iPad, but you can enable Private Browsing in iOS for the time being while you’re on the go. Not all web browsers support the feature yet, but future versions of Internet Explorer and Google Chrome will include the option too. You can read more about the general concept on Wikipedia if you’re interested. I prefer Private Browsing on a case-by-case basis, some of the “tracking” features are actually useful: see what your friends are liking and sharing when logged into Facebook, relevant ads, targeted stories on news sites, etc. Just my 2 cents. The question is does this information get stored in a file anywhere on mac osx? This is totally dependent on the site to implement and adhere to DNT, i.e. you will go a long way before you find sites that choose to discard monetizable information. Instead, get the Free DoNotTrack+, and kill all of the literally dozens of trackers that infest most web sites, including Facebook. On my system, DNT+ has killed just under 100,000 tracking attempts in the past few weeks, 18,000 of them from Facebook Like buttons, and quite a few from this web site. How/where do I find DNT+ ? I found plain DNT in Safari settings on my Mac, but see no option for the ” + “.